So I’ve decided to somewhat refocus my collection. If you’ve stopped by the player collection or set pages, you may have noticed a few changes. So here they are. First, this means reorganizing my player collections. Baseball: Tyler Colvin, Geovany Soto, Fred McGriff, Hanley Ramirez, and Ken Griffey Jr. are all most likely permanently deactivated player collections. The last two weren’t on the list, but I never officially dropped them until now. Carlos Zambrano and Felix Hernandez are at least temporarily deactivated. David Ortiz is an active player collection again. 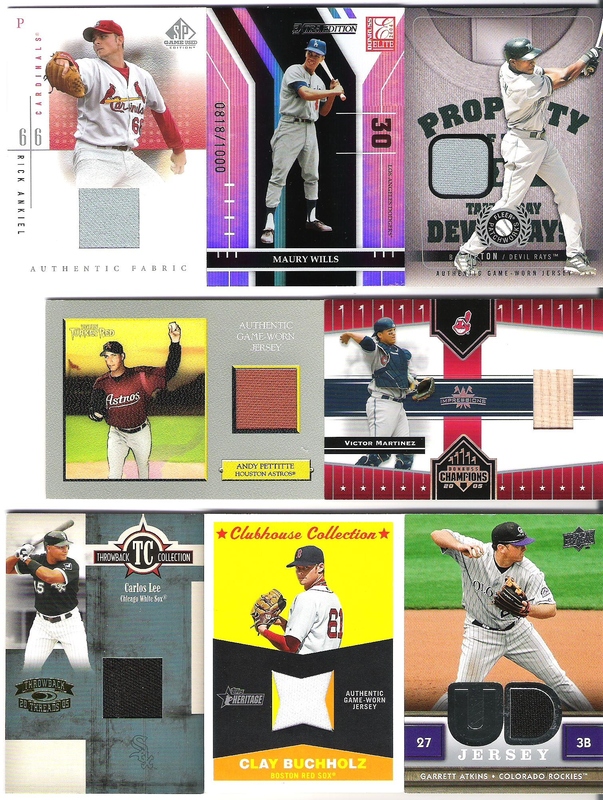 Nomar Garciaparra is now an active player collection as well. Basketball: Julius Erving, Rashad McCants, Joakim Noah, Antoine Walker, and Dominique Wilkins are most likely permanently deactivated player collections. 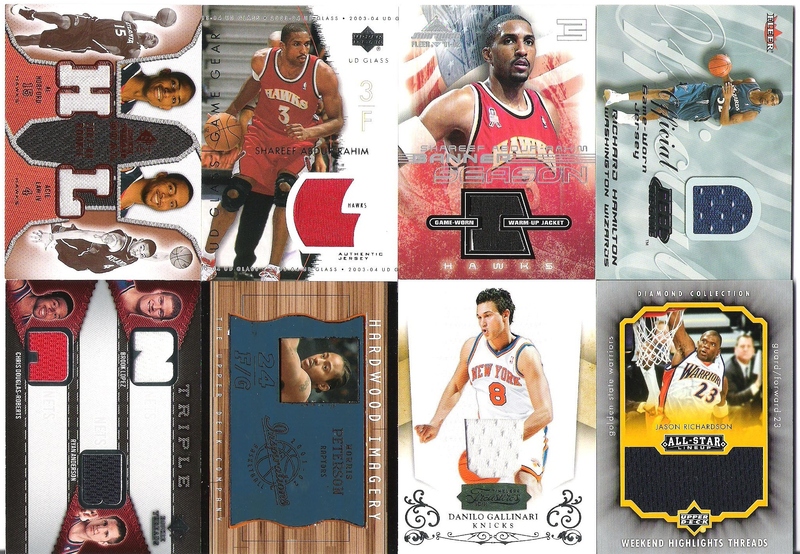 Luol Deng is now an active player collection. Jason Richardson is under consideration to be be added. Football: Johnny Knox, Richard Dent, Mike Singletary, Greg Olsen, Rashard Mendenhall, Chad Ochocinco, Randall Cunningham, and Jerry Rice are all most likely permanently deactivated player collections. Warren Moon and Josh Freeman are temporarily deactivated, though I only have maybe two cards of Freeman anyway. Several other guys I’m dropping in various sports have less than five cards apiece too. Hakeem Nicks and Eric Decker are under consideration to be added. In other player collection news, I think Dustin Byfuglien and Marian Hossa will be my two hockey player collections, and Hope Solo in soccer. My active pro wrestling collections are Booker T, Eve Torres, and Gail Kim. All that said, if the opportunity arises to land trifecta pieces for any of my deactivated player collections, I will still make a deal. Baseball: 2009 Bowman Draft Picks & Prospects WBC Purple Refractors are no longer being pursued. I will be keeping the five or six I have though. I’m still a World Baseball Classic fan. 2011 Gypsy Queen Green Framed Paper Parallels are no longer being pursued. According to what I had listed before I deleted it, Tris Speaker, Johnny Cueto, Ian Kinsler Johan Santana, Pee Wee Reese, George Sisler, Rogers Hornsby, Josh Hamilton, David Price, Derek Jeter, and Ozzie Smith should all still be here and available, preferably for any The Great Ones I still need or other Framed Papers of players I collect (either color). 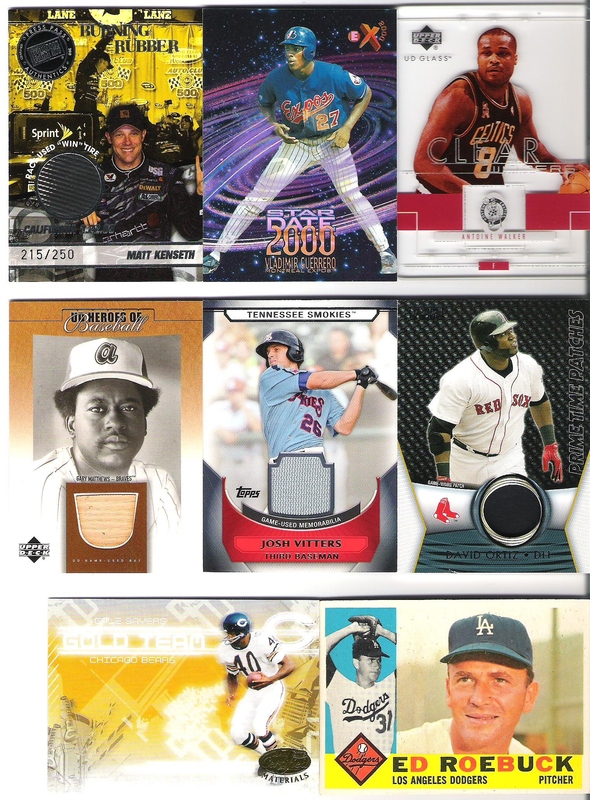 2011 topps Diamond Anniversary Parallels have long been abandoned, but now they will no longer appear on the set wantlists page. Between regular and Cognac, I’m pretty sure I have over 40 available for trade. 2008 Goudey Sport Royalty, 2009 topps Chrome WBC, and 2011 topps Kimball Champions are under review. 2003 Donruss Estrellas Leyendas del Pasado has been added. 2009 Topps Unique Unique Unis has been added. Basketball: 2009-10 Upper Deck 3D Stars are no longer being pursued. As such, Dwight Howard/Kevin Garnett, Kevin Garnett/Paul Pierce, and Dwyane Wade are available for trade. Why am I doing all this? Well, my funds are limited as ever, and my tastes are changing. I’m now actively seeking trifectas, and key rookies in general (super/stars of their day, historically significant players, Hall of Famers), amongst other things. So I thought it was time to part ways with some sets and players I’m less committed to, and best to do it in some official way. I’ve also set up a new page specifically to track my themed collections. So, with several items no longer on my plate and knowing how I want to proceed with the rest, things will hopefully be ever-so-slightly more focused heading into the new year. Now if I could just get my cards themselves in order so well. Seriously, if you’ve been waiting for ages on a trade package from me, you can rest assured it’s because I lost an important piece of your trade amongst my endless piles of random cards and it hasn’t turned up yet. So, that’s it for now. Hopefully I’ll have something to say about anything again real soon. Just pray that it isn’t politics related. That would be… unpleasant, for everyone involved. Better get these posted up, since my ginormo 123 card order got here a few days ago and will be scanned soon. Plus there’s another good-sized order I’ll be having shipped before Christmas! I’ll see about getting the trade bait added onto it’s proper page after I finish (this could mean tomorrow or 2018, I don’t know). In other news, I have at least three packages going out over the weekend as well, possibly more. Now then, onto the pretty pretty card pictures. Huzzah! Iconic minis, Agent Zero, Japanese stickers, a set completing starlet, and some numbered Cats..
None of these are for trade. The Kenn/Cat is a red parallel #’ed /50, the Fusion is to /150. The 1980-81 style Arenas is part of a booklety-type thing, except his was missing. I have a Chris Paul that’s all together though, so I’ll go into more detail whenever I get CP3 scanned and posted. The COMC pics don’t adequately describe it. Kosuke and Tuffy aren’t too exciting to look at, but I didn’t even know there were stickers like that made in Japan. 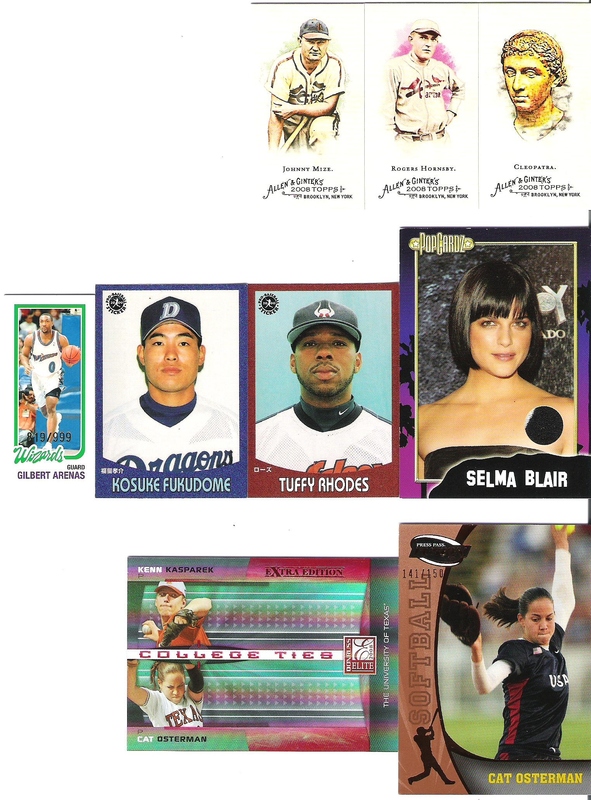 Finally, Selma Blair completes my PopCardz relic set, but that too is another post for another time. A tire swatch, a shiny Vlad, a super thick and transparent (and I guess die-cut) 'Twoine, The Sarge, Vitters, a great player with a lame patch, Gale Sayers, and a '60 high number..
Only The Sarge is for trade. Ed is my second ’60 high number, which is pretty good considering I’m just barely into double digits overall. 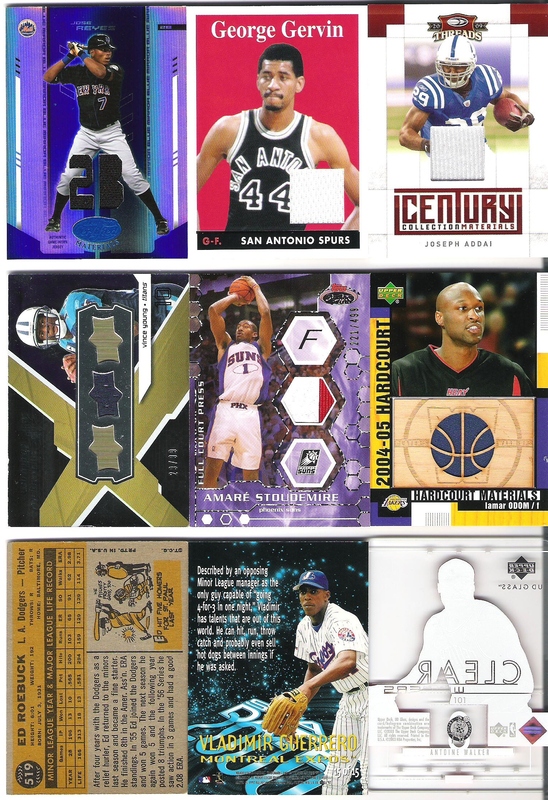 I say maybe die-cut on Antoine Walker because the five tiny squares at the bottom and the three near the top are holes that go clear through the card, which is patch card thick. Love that tire swatch; trying to at least one of every single type of relic card in existence. The Vlad is from the golden age of shiny cards. In fact it doesn’t so much shine as glow. It’s a lost art. Topps just doesn’t have it, and every attempt I’ve seen Panini make at shiny is downright atrocious. Papi’s patch really is lame. It’s hard to say for sure that it’s even a patch. Vitters only set me back about $.75, if I recall correctly. And Gale Sayers… well, it’s GALE SAYERS, what more need be said? All of these are for trade. I think the theme here is underrated. If you keep offering up any of these guys for as little as this, I suppose I will feel compelled to take them every time. There’s just a certain price point for some guys. The Hawks are probably all going to Dayf unless someone else wants to make an offer on them. I’ve got a mess of stuff for him already, so if he doesn’t come over and outright demand them, it’s probably not a big deal. Anyway, have at thee. An unfortunate necessity, Maury, BJ, Pettitte is already claimed, I think V-Mart is too, Carlos Lee in his days on the South Side, Buchholz (was he claimed too? ), Atkins on the Rocks..
Have at these too. They are all for trade, or were. Pettitte was claimed by zee Dimwit, I think Baseball Dad got V-Mart, and I want to say Buchholz was claimed too, but I don’t know for sure. If you claimed it, speak up, otherwise I’m listening to offers again. Cardinals, bleh. But we Cubs fans need to have some around for our Missouriable rivals. It’s a symbiotic thing. Better to send ’em to someone who will inexplicably cherish them than make kindling out of them I guess. The Marlins last hope get a fanbase, Iceman, Addai, a fellow headcase, Amar'e, Mr. Kardashian, and some card backs..
Reyes is bound for Wicked Ortega country, Amar’e was claimed by Plaschke ages ago, but the other four are available. I despise all that the Kardashians stand for, but that Odom is just a good looking card. It’s also hilarious. Listed as a Laker, pictured with the Heat, and the back says the jersey swatch is from his time with the Clippers. I’d like to believe the floor came from his high school, lol. Does Vince Young still have fans or collectors? Do the Colts? Also, there’s the back of the Antoine Walker card. Yup.